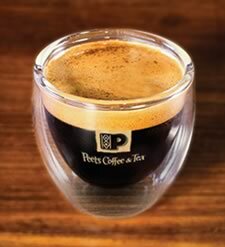 Peet's Espresso is made with dark roasted, fresh ground coffee beans and are hand pulled. Single, double, and triple shots are available and Peet's espresso shots are the basis of all their espresso based beverages such as Cafe au Lait, Cappuccinos, Caffe Con Panna, Caffe Americano, Caffe Macchiato, Caffe Latte, and Caffe Mocha. Peet's Espresso is also served over ice. Peet's Iced Espresso has the same amount of caffeine. Caffeine in espresso can vary due to many factors and what's represented here is the average amount a consumer could expect to find. How Does Peet's Coffee Espresso Compare? Peet's Coffee Espresso contains 46.67 mgs of caffeine per fluid ounce (157.80mg/100 ml).